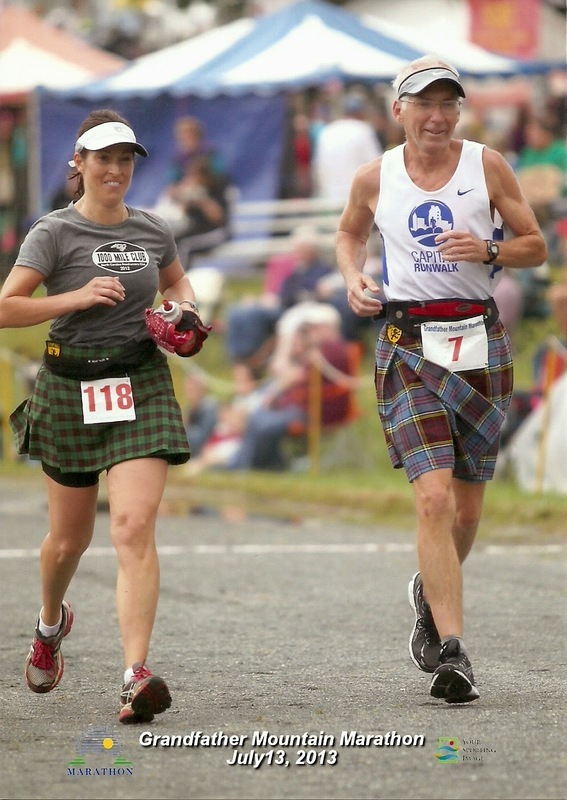 runjoey: Grandfather Mountain Marathon Preview Part one , my history. 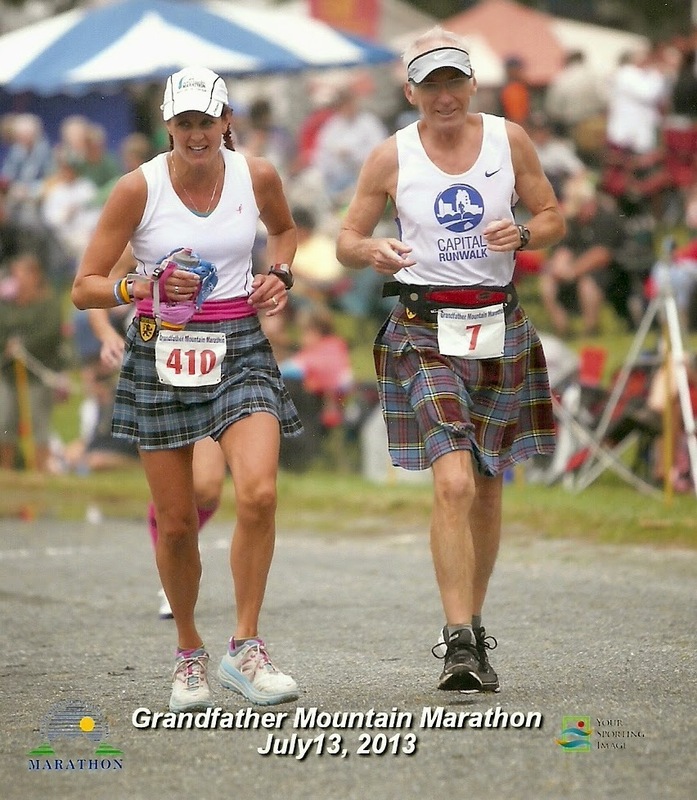 Grandfather Mountain Marathon Preview Part one , my history. A little hard to believe but I will returning for my 9th trip for the GMM this weekend. I made my first run there in 2003 and it was my 2nd marathon since I began to get into the long distance races. I had been aware of it and looked at the results going back to the late 70's when I first began running and I have to admit I was little intimidated by it. This will be the 45th year of the race making it the oldest marathon in NC and there are not too many that have been held that many years in the country. I was a little disappointed to find that first year that due to a bridge being out that we would have to take a detour and I would not be running on the historic course for most of the first 10 miles. Instead we stayed on the highway all the way to the Parkway at about mile 8 and then joined onto the regular course just past the 10 mile point. It was a bit warm and humid and I ran under the circumstances a pretty good race for me in 4:41:52 , just 8 minutes slower than I had run in Richmond the previous November. That included a lot of walk breaks and hamstring cramps in the last 4 miles. I returned in 2004 and they still had to re-route us on the highway. I was slower that year in 4:47:20 with the usual cramps and bonking toward the end. I skipped 2005 because of a trip to the Vermont 100. By 2006 I was in a whole lot better shape after training so hard to get my Boston qualifier and running my marathon pr in February. I was brimming with confidence, the weather was better and I had a goal of breaking 4 hours. We were finally able to return to the original course for the first 10 miles but then had to take another detour because of a bridge replacement on the Parkway ! I was actually able to run the first 11 miles with Laura Mac The Trail Angel but she was picking up the pace way too much for me so I had to let her go to keep from blowing up. My race went great until I realized that all the mile markers on HWY 221 had been replaced and I could still see the old ones about .6 miles later. Well sure enough I got to mile 26 in 3:56 and was no where near the stadium ! Turned out with the detour the race was about 26.8 miles and I would have been 3:58 but instead have an official time of 4:04:08. Grrrr. I skipped 2007 because I didn't want to run it worn down from Western States . As you may have noticed I have no pictures from those first 3 races but started running with the camera after that. That was the year the tradition of getting a picture with my training partners at mile 10 begin ! Laura was the original Trail Angel and the first to have the picture taken with me there. Here is my report form that year. A link to more pics in that report. I was back again in 2009 and this time I was finally able to get Karla to come give it a try and Lisa was along for the trip too. This would be my 10th marathon with Karla. I was in my comeback year and had just completed my 1st Ironman 3 weeks before so I was just hoping I could stay up with the girls. The track was closed so yet another alteration to the course had us running a lap around the parking lot at the start ! We did have a great time but I fell behind at mile 24 or so and couldn't catch up fighting calf cramps. finished in 4:49:15. In 2010 I was back in good shape and came up with the crazy idea of doing the first ever double Grandfather. Karla and Lisa were along for the adventure with me planning to run marathon # 11 with her. Lisa was going to do her own race but the two of them would provide support on the return trip as soon as they could get back to the car. Jenn was along too and would take the shuttle to the top and run the 2nd half back down with me. I had a lot of fun running the real race with Karla and we finished together in 4:56:24. It was hot on the way back and tough but I got it done with the wonderful company Jenn provided. Here is a link to that report and some pictures and video if you have a lot of time on your hands ! I skipped it again in 2011 to run the Tahoe Rim 100 ! That was awesome ! I returned in 2012 but this year I knew I was in for a struggle. I was very worn down from the Boogie 100k and the dog bites and antibiotics and had been struggling the week before just to finish my normal easy runs. On top of that it was a terrible warm 100 % humid morning most of the race and I did struggle ! I was finally back in good shape for 2013 and this year along with Lisa my friends Margo, Amy and Jenn were all along. My plan was to run the race with Jenn since this was her first time actually running the race after doing the reverse course with me in 2010. I was hoping we could all stay together at least until mile 10 for the traditional photo spot. We did start together but by mile 4 Amy and Lisa were falling behind and I knew they were in for a long day. I was feeling great and having a wonderful time just cruising along with Jenn. We kind of leap frogged with Margo and luckily we were together at mile 10. Some where around mile 14 margo pulled ahead for good and had a great finish. Jenn and I contniued to have a lot of fun and although she slowed toward the end we had a decent time of 4:41:42. After getting some gatorade I headed back on the course to go find Amy. I was feeling great and thinking it would have been a good year to have done the double ! I found Amy and she was happy to see me. It had been a bit of a rough day for her but she ran strong all the way the last mile to the finish and I was able to get my 2nd picture of the day on the track ! Well that brings me up to date. Stay tuned for the this years preview and report.